Receive email alerts when new posts have been published! 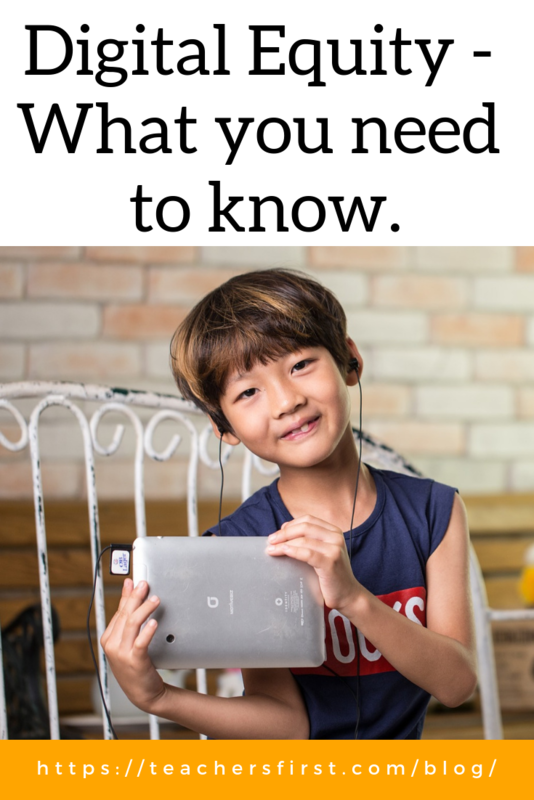 Digital Equity – What you need to know. Digital equity……what does it mean? According to the National Digital Inclusion Alliance (NDIA) “Digital Equity is a condition in which all individuals and communities have the information technology capacity needed for full participation in our society, democracy, and economy. Digital Equity is necessary for civic and cultural participation, employment, lifelong learning, and access to essential services.” In plain English from ISTE (International Society for Technology in Education), digital equity is equal access and opportunity to digital tools, resources, and services to increase digital knowledge, awareness, and skills. What does this mean for all of us as educators? 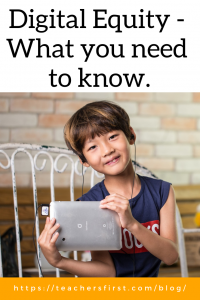 For educators, this means doing what you can to make sure students have equal access to devices, software, the internet, and assisting them in learning the proper use of these items. Digital equity is not just all about the access. In the short term, Digital equity has been shown to make it easier for students to complete homework, give them access to technology outside of school time, improve parent-teacher communication, and provide students with digital citizenship education. In the long term, we must remember that we are preparing our students for a future in which technology skills will play a large role, and digital equity will ensure that the entire future workforce is prepared to meet the future demand for technology skills. There are many resources available for educators, schools, and districts looking to assist in bringing about digital equity in their communities. ESchool News recently published an article with ten examples and resources to address digital equity which include advice about going 1:1, home access gaps, and connecting students with digital resources during school breaks. COSN (Consortium for School Networking) produces a digital equity initiative toolkit that highlights district strategies to implement that will help students with internet access as well as community partnership suggestions. Join a group working for digital equity, like ISTE’s Digital Equity Network. Become a Digital Equity Champion by working with Everyoneon. Encourage your district to join the Future Ready Schools Digital Equity Program. Share resources with your students like community spaces that offer free internet access, devices, programs, and help like their public libraries. Teach them digital literacy skills. Digital equity is an issue that we as educators should all be concerned about. We can work together to assure that all students everywhere will have the necessary tools and skills be technologically ready for the future!